The Book of Revelation, arguably humanity’s ultimate authority on the End Times, speaks of “flashes of lightning, and rumblings, and rolls of thunder, and an earthquake, and a great hailstorm,” as God unleashed his wrath upon the Earth’s unruly children. But despite vividly-imagined plagues of locusts and seas of blood, the authors of the Bible somehow failed to account for a staple of the apocalypse circa 2017, the fire tornado. Portugal is in the midst of a horrific wildfire season, one that has left more than 5 percent of the nation torched thanks to a combination of humans lighting fires, human driving climate change, and former Hurricane Ophelia, which fanned the flames with powerful winds as it swirled into the North Atlantic last week. In addition to destroying property and claiming at least forty five lives, video footage captured by a firefighter on October 7 shows that the fires are spawning tornadoes. Well, sort of. 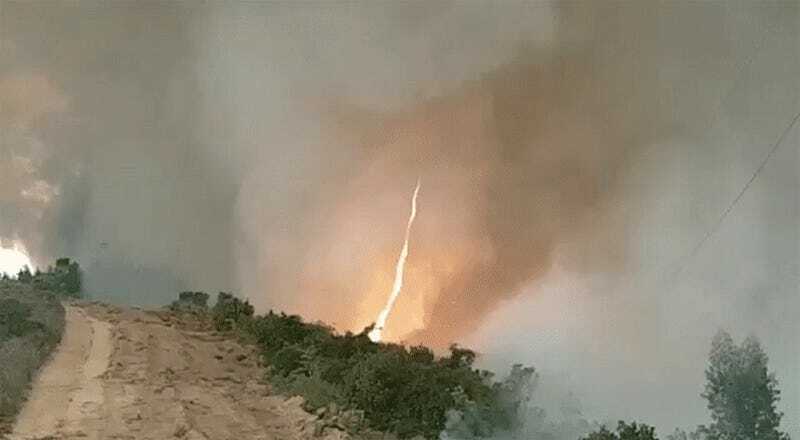 So-called firewhirls, firestorms, or firenados, form when superheated air from a fire rises rapidly, dragging some of the fire itself along with, in an area with “sufficient horizontal or vertical vorticity,” according to NOAA, per the Washington Post. Essentially, as blazing hot air rises, more air rushes in to fill the empty space, creating an updraft that helps the firewhirl develop its terrifying, towering structure. Firewhirls aren’t new. They’ve been spotted during recent wildfire seasons in California, in a Canadian brush fire last spring, in the Brazilian state of San Paolo in 2010, and in this epic video filmed in Northern Territory, Australia, in 2012. While a firewhirl is more akin to a flaming dust devil than an actual tornado, there’s evidence that fires can spawn bonafide tornadoes, too, a process known as pyro-tornadogenesis. These start with the formation of a pyrocumulus cloud, a thunderhead that emerges over a wildfire as rising hot air cools and water droplets condense. Pyrocumulus clouds are also known to produce lightning. So, yea, fires can create some seriously hellish weather. As landscapes around the world become more fire prone due to a slew of human-driven changes, expect to see more of it. At least the seas haven’t turned to blood, yet.